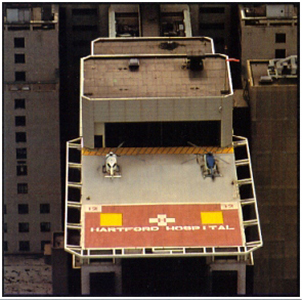 Hartford Hospital Helipad | Heliport Systems Inc. Permanent, approved heliports at hospitals are essential for safe and efficient transport of patients. Heliport Systems, Inc. is highly experienced in working with hospitals in establishing heliports which are close to patient treatment areas, safe for pilots, minimize noise impact on the community, yet which are affordable. Our proven designs and materials result in attractive, nearly maintenance free, facilities for years of use. Fully insured.